DUG Insight User ManualFrequently Asked QuestionsFrequently Asked Questions Views and DisplayMy data loaded successfully. Why can't I see anything? After loading your data, first make sure to open an appropriate view. From the Control Panel, open the View menu and select IL/CL View for inline and crossline cross-section views of data volumes. In the upper right-hand corner of the window there is a volume selector drop-box. Make sure to choose the volume that you wish to view, and that you are viewing an inline or crossline that contains data. If your volume is not appearing in the drop-down list, check that the circle beside the volume in the Volume tab is green. If the circle is amber, click on it to turn it to green to enable the volume. Tip: You can click on the volume in the Volume tab to display the Details Panel. 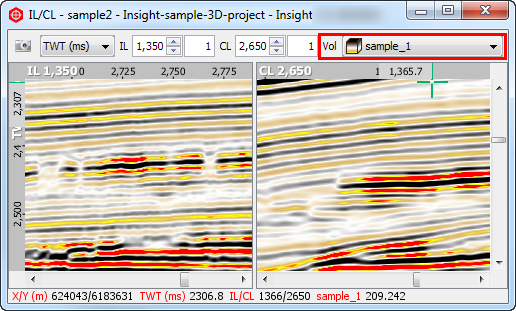 In the Details Panel, check that the IL and CL in the IL/CL View are within the IL and CL extents of the volume. 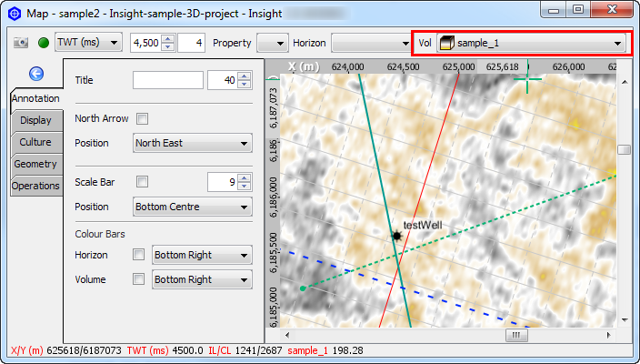 If you wish to see time or depth slices, select Map View from the View menu. In the upper right-hand corner of the window there is a volume selector drop-box. Make sure to choose the volume that you wish to view. If the volume is not appearing in the drop-down list, check that the circle beside the volume in the Volume tab is green. If the circle is amber, click on it to turn it to green to enable the volume. If you have a view window open and you are still unable to see your data, you may need to adjust your class settings. 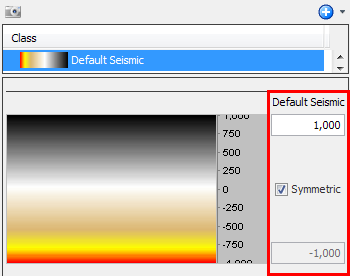 In the Volume tab, open the Details Panel for your volume and look at which class it is using (the default class is called "Default Seismic"). In the Class tab, open the Details Panel for the class. Examine the maximum and minimum clipping values for your colourbar and make sure they are correct for your data. If the values are far too large, your data will appear as a single colour, often white. For more information about Class Settings, see Classes and Colourbars. If your problem persists, please contact us at support@dugeo.com for assistance. Next: Why is the 3D view not opening / giving errors / crashing?